Yet in Florida, the fossil fuel industry has forced the appearance of need by blocking the efforts of Floridians to fully develop energy efficiency and renewable energy options. In addition, at the endpoint of the pipeline in Martin County, Florida Power & Light has built a facility to create Liquid Natural Gas (LNG) — a key step in the export process. 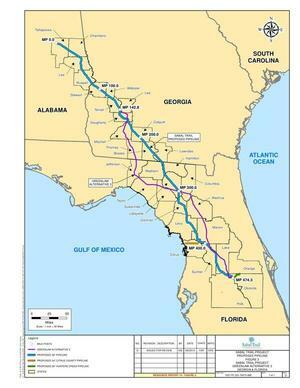 Any plan to export LNG clearly demonstrates that Floridians have no ‘need’ for this additional gas pipeline. It’s simply further business development for the fossil fuel industry. It is not in the public interest and should be denied. Florida’s karstic minerals are corrosive to pipelines, and gas lines are explosive. Existing pipelines are not properly accounted for or monitored. Pipelines run through rural areas and small towns with little knowledge, experience or voice in the process. Floridians are working hard to protect wetlands, springs and rivers all of which are negatively impacted by the pipeline. Please deny this permit. Florida water is too valuable, and dirty fossil fuels are not Florida’s future. 2150 W D Kennedy Rd.